1 bedroom boasting a comfy Queen, Bathroom with oval spa and separate shower, separate toilet, reverse cycle airconditioning , wood fire, full kitchen, wide screen TV, DVD, CD. Bose Surround Sound System with Ipod dock. Beautiful place with beautiful views! Took the partner away for her birthday and we were both in love with it! Beautiful views from the deck and very private! Would recommend for anyone! A great spot to unwind! Clean, relaxing & very comfortable. Accommodation was very clean and nicely decorated. Location was very peaceful. Lovely place to stay for a peaceful few days. We have stayed in many places similar to this and would like to make the following suggestions; include some books/games/magazines/DVD movies, optional breakfast basket could be organised through a cafe?, a block out blind for the bedroom as was extremely bright in the morning and finally as many other guests have suggested more wood for the wood burner (compared to other places we have stayed there was barely enough for 2 evenings without putting it on in the mornings when it was cool). With these small changes it would be perfect. Thank you. 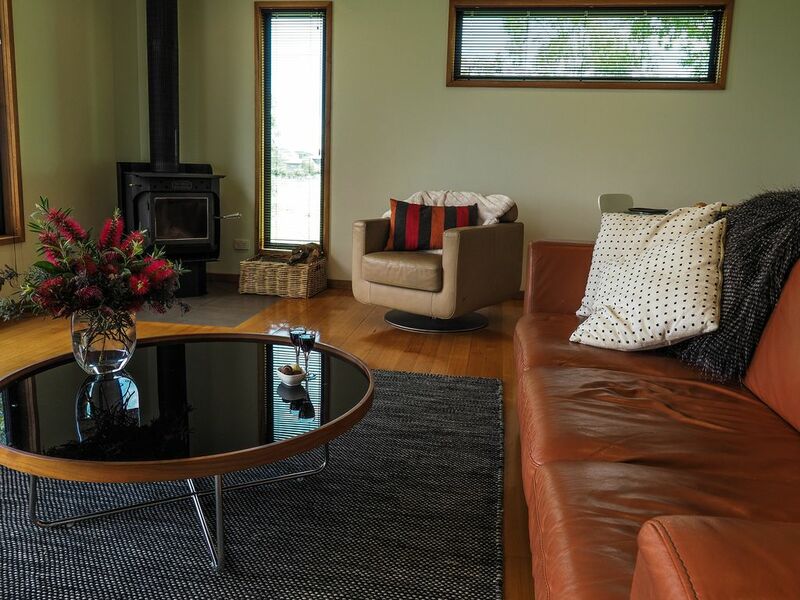 Beautiful place, serene atmosphere and all a close distance from the centre of Daylesford. Excellent getaway for a break!!! Great setting with lovely views. Nice modern accommodation. Disappointed in a few things. First being communication, many messages left unanswered, how ever Im confident when i finally did get onto owner this will be improved in future. There was no plug or dishcloth for the kitchen sink, the frypan was to small to cook in, there was dishes from the guests before left in dishwasher and fossilised rasin bread in the cupboard over the microwave, kettle is also a . 8litre (2cup) capacity and the wood allocation lasted 12 hours at a stretch. I have wood heating at home so believe me when i say stretch. We did enjoy the accommodation itself however i do think when paying for accommodation such as this the luxuries are in the smaller details, especially those that make the stay comfortable. With a few tweaks the place would be fantastic.